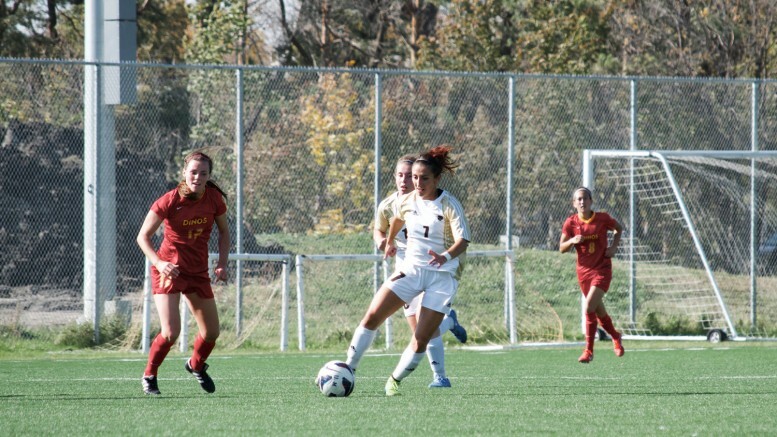 The University of Manitoba Bisons women’s soccer team is certainly developing a good way of responding to deficits. Following a tough loss to the Calgary Dinos on Saturday, the Bisons hammered the Lethbridge Pronghorns 3-0 on Sunday. The victory against Lethbridge will provide some needed comfort before their derby match against the Winnipeg Wesmen at Investors Group Field on Oct. 9. It also caps off another weekend which saw the Bisons respond to a loss with a resounding victory. The Dinos and Bisons kicked off their match in excruciatingly windy conditions – a major contributing factor in the performance for both sides. Calgary goalkeeper Erica Fox was under early pressure when she faced Bisons strikers Camille Plett and Alanna Shaw on breakaways, but she was equal to them. Calgary took the lead through Jordan Smith’s curling effort that flew past Chloe Werle’s reach. Ten minutes later, Manitoba responded through Shaw, who rounded Fox and finished for the equalizer. Heading past the half-hour mark, the wind nearly took its toll on Fox. Megan Graca’s ambitious half volley from a distance slipped through the hands of the goalkeeper before pinging the crossbar. Werle was almost celebrating an extraordinary goal of her own when her long ball traveled the length of the pitch and bounced just past Fox’s post. Just after halftime, Werle produced her finest save of the match by tipping away a Maddison Fritze drive from 20 yards at full stretch. The Bisons’ number one was kept busy, making 14 saves. At the 69th minute, the Dinos snatched the go-ahead goal through Mollee Ramsay’s strike, which slipped through the grasp of Werle, despite the keeper being able to get her hands on it. Three minutes later, Calgary cushioned their lead through Fritze, converting a drive to the bottom left corner. Speaking after the 3-1 loss, coach Vanessa Martinez-Lagunas discussed her game plans for their meeting against the Lethbridge Pronghorns. The Bisons swapped goalkeepers for their second matchup of the weekend, with Wilford replacing Werle ahead of their visit from the Pronghorns. Within the opening half of the first 45 minutes, Manitoba had already gotten off to the ideal start. Shaw played through winger Selina Speranza to draw first blood for the Bisons. After 20 minutes, the lead was extended to 2-0 through Elyce Molyneaux’s premiere goal of the season. Ten minutes into the second half, the Bisons began to run away with it. Plett’s strike saw the Bisons take a commanding 3-0 lead, yet the Pronghorns continued to prove themselves a threat. At the 75-minute mark, Emily Felker forced a save from Wilford and then the Bison goalie denied striker Lindsay Amatto with two more saves in succession to keep Lethbridge at bay. The goalkeeper played the entire 90 minutes, keeping the Dinos’ score sheet clean while making an astounding 14 saves. With their fourth victory of the CIS campaign, the Bisons have matched last season’s mark with six competitive matches remaining before the playoffs. It’s a clear indication that the Manitoba Bisons are improving and will continue to do so for the rest of the year. The herd will take a break for the upcoming week before their derby match at IGF and the Duckworth Challenge. Finishing on a high note with three points and a clean sheet to boot, the Bisons have generated some much-needed momentum and confidence ahead of the critical match.